All of a sudden eating out feels like fiscal insanity. However, if you must go to a restaurant, I suppose it might as well be a no-nonsense Scandinavian one. For there is nothing like the brisk business of open sandwiches (one wee slice of bread, not two! ), meatballs and herrings to remind you of hard times. And even rationing. Madsen has just opened on an island of shops and cafes regularly used as a stepping stone to south Kensington tube station. The restaurant is opposite a Lamborghini dealership and on our first visit some of the most expensive cars in the world shimmered peacefully behind the plate glass window. On our second and most recent visit – Sunday lunchtime - the window has been bricked and the glass shattered into a spider web of jagged, violent cracks. Who would do such a thing? Perhaps it was the same someone who attempted to smash the windows of the Ivy last week, when rocks were hurled at the restaurant during lunchtime as unsuspecting diners nibbled away inside. Out on the streets, disgruntled activists were venting their rage about the economic situation and the capitalist fat cats and bonus boys they imagined to be inside slurping caviar before rushing off to buy a Gallardo Spyder. Poring over Madsen’s selection of warm smorrebrod it struck me, not for the first time, that no one should underestimate the dangers of restaurant reviewing. Madsen has a crisp, minimal interior and the type of pale wood furniture you would expect to see in the smarter in-store cafeterias in downtown Copenhagen. Outside there are red blankets on the chairs and coloured glass votive candle holders. Given the number of panhandlers who prowl these particular streets, nailing down everything that doesn’t move would be a good policy. Speaking of nailing things down, S is rather excited about the waitresses, who are all attractive and charming in that alluring, clear-skinned Nordic way. Or ‘lovely blonde cherubs’, as the old fool insists. He’s not so keen on the chairs with low backrests, which ‘gives me a mental impression that I am about to topple over’. Has he ever been so wrong and yet so right? We move to a padded bench facing the room, where he can gum his schnapps in comfort and make unsolicited comments about the decor. The most notable thing about Madsen is that it is one of those self-styled ethical restaurants, keen on sustainability and being green. They do not use patio heaters on their tiny terrace, nor any tablecloths in their bid to save the planet. ‘Repeatedly washing linens,’ they say, ‘uses up precious water and energy, and leads to excess detergents entering the water system.’ Good for them, but I hope they don’t feel the same way about the staff uniforms. Due to the ‘carbon emissions involved in the transportation distances’ they stock only European wines, not new world. They also print their menus on recycled paper and filter all their tap water using the Vivreau system. Unfortunately, they then charge customers £3 a bottle for them, making you pay for the luxury of their ethical beliefs. It’s a bit like those hotels who prey on your consumer conscience while saving their own money by not changing the bath towels. At the back of the restaurant there is a white Corian bar, while some classic and lovely Danish lamps provide soft lighting. 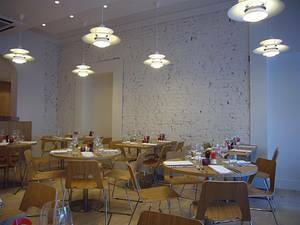 The restaurant’s single most striking feature is a whitewashed wall that has had its plaster removed to show butchered brick work. ‘It needs pointing,’ says S, failing yet again to grasp the rudimentary design features of Scanda-rustic. Then again, the laminate flooring wobbles when you walk across it, which is perhaps a bit too rustic for comfort. Madsen is open throughout the day, and offers snacks, lunch and dinner menus. The restaurant also has plans to provide a traditional Swedish smorgasbord buffet every Sunday and also a Christmas buffet. In the meantime, the usual Danish suspects are here; lots of hot and cold smorrebrod, meatballs, plaice and thick slices of bacon. There’s no roast duck, however, which is disappointing. Smorrebrod preparations include smoked salmon topped with homemade mayonnaise, Greenland prawns and dill; prawns with hard-boiled egg; roast beef with remoulade; smoked, salted ham (hamburgerryg) with potato and asparagus; roast pork and crackling topped with home-pickled red cabbage; and chicken with fried mushrooms. I could go on. There is nothing these people can’t plonk on a square of rye bread and call a national dish. Main courses include a less than traditional Caesar salad with chickpeas and toasted hazelnuts, while not everything translates into tempting dishes. Creamy broccoli served cold, topped with bacon? That sounds more like a penance than something to eat. There is also a selection of snitter, which are canapé sized smorrebrod. To begin we have the Scandinavian herring platter; a trio of dressed herring. The first is marinated in a fruity, zingy mix of orange, cranberry, and vodka. The second is pleasantly scented with dill and the least successful is the third, which has been breaded, fried and is served with onion and pickled carrot. Still, all very nice washed down with a glass of aquavit. 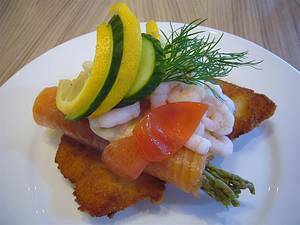 From the selection of warm smorrebrod we order a stjerneskud. It may sound like the noise made by your knee banging off a recycled water bottle, but it is in fact pieces of steamed and breaded plaice, served with mayo, prawns, asparagus and smoked salmon. A healthy, appetising-looking plateful, it is excellent, apart from the steamed fish, which is rather soggy. A plate of snitter has five pieces, including a reappearance of the carroty herring, which is a low blow. The rest are pleasantly prepared and tasty. Main courses we order are less successful; the frikadeller meatballs squelch with fat, but perhaps this is the nature of the beast. They are served with potato salad and pickled cucumber. Prawn salad is a big clump of mayo coated prawns; not a success. Scandinavian desserts always seem to centre on cakes and here is no exception; we have an utterly delicious home baked almond cake, served with baked plums and vanilla ice cream. Madsen may be pleased with their sustainable wines, but for a restaurant that predominately sells fish, it is odd not to have a dry white by the glass. We had an uninspiring Spanish medium white (El Muro Blanco) served too warm. The list needs much attention. Over the road, sunlight glints on the broken glass of the Lamborghini garage and the world moves on again. I like the bracing healthiness of Scandinavian food, although it has some way to go to exert the global grip of Italian, French or Chinese. Will it ever gain traction beyond its own ragged, salty shores? Don’t snitter. Madsen may be unconvincing, but ultimately you never know. Madsen, 20 Old Brompton Road , London SW7 3DL. Tel: 020 7225 2772. Lunch, two courses £13.50, three courses, £17.75. Smorrebrod priced individually.